Leading up to the party, I spent a day running around getting seedlings at Eastern Market, and citronella torches, and all manner of other yard accessories including a highly essential pink flamingo. We went to Prince Valley in Southwest Detroit, the CVS near the science museum, over to the East Side to drop off groceries and to Lowe’s in Whoknowswhat suburb (Grosse Pointe?). It was oddly exhausting, as if I had forgotten all of the things that go into throwing an event. By the time I got back to my house, I had hoped there would be time to put together a garden swing my mother had given to me before I moved. I could not find the directions anywhere, and called my mother. After about twenty minutes on the phone getting nowhere and my mom saying things like “well, of course most things have UPC codes” I was unsure why anyone had parties or went shopping or owned lawn swings to begin with. This wasn’t her fault, it was just a long day and I was cranky and skeptical by the end of it. I had also purchased a grill on the cheap (thank you Memorial Day sales on gifts for Father’s Day). I spent the day before the party putting together the grill by myself and also planting seedlings and weeding after what seemed like a full day of extreme rain. I get over-excited by completing tasks like these, as if they were impossible. It was suggested that I might pay for a technician to put together my grill, which I think added to my sense of righteous indignation that I could do it my daggone self. And I did. It made up for the fact that I’m too short to change most of the lightbulbs in my house on my own. Yes, even with a stepladder. The one issue was that over the course of building the grill, I had over extended my back, leaning over at weird angles to get the screws in the right place. I thought again about why hosting parties was something anyone considered doing. 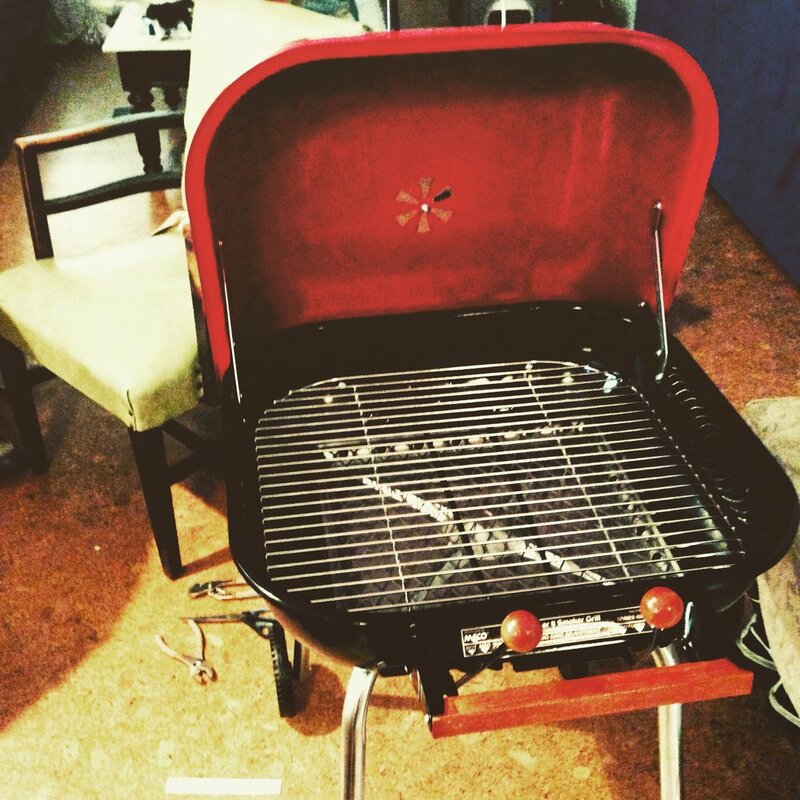 I suppose you don’t always have to put a grill together, but I did. When Monday came, there was a lot of last minute cleaning and furniture moving. Corina was convinced “about twenty people” were going to show up, although I kept insisting it would be more based on both the Facebook event page and the number of people she knows. There had also been some confusion about whether to have the event outside or inside. I had assumed we’d mostly be in the back yard, and said and done several things indicating as much. It wasn’t until Sunday that Corina had asked me about it, because the whole time, she had seen it as an indoor event. She also kept insisting that it was going to rain all day and be cold. It wasn’t, but we’d already prepped to do the party inside, and none of it ended up mattering. I fired up the grill (another enormous victory for Casey-kind) and ended up cooking on it for the beginning of the night, hovering nearby and testing its heat like a barbeque-fixated dad. People came outside, chatted about the grill and the house, smoked cigarettes and told stories. The bulk of the attendees were inside the house. All told, there were probably 50 people that came through over the course of the night. There were artists, farmers, activists, writers, actors, dancers, parents, photographers, healers, soon to be social workers, food truck owners, and people that just smelled really good. Everyone was gracious and warm and it felt like exactly the kind of party I’d want to go to. I take only slight and very partial credit for its success, honestly. If for nothing else, I think Kezia’s fish and veggie tacos, grilled corn and the buffet of laughter really did the trick. After about an hour of eating and mingling, there was also a poetry salon of sorts. Crowded in closely in my living room, the party became audience to a reading. Corina read some of the work she had submitted to the writing retreat. Morgan Willis read some poems and what I like to call snapshot fiction. I also read some poems, and was then encouraged to do standup comedy…which I always assume is because my banter is more palatable than the horrible things I often write about. It was a blast, and it was apropos to have a reading at the inaugural party in the inaugural Write A House. Despite the preparation crankiness, it was evident it was worth it, because the end result was a really magical evening that I was so happy to share with new folks for an event to make another writer’s dreams possible.